Birds of a Feather is a heartwarming story about the hope and courage it takes both people and animals to heal from trauma, and the uplifting results when they undertake the work of healing together. Dr. Lindner has a love for birds; the first bird she rescued was Sammy. Sammy was rescued in December 1987 from a mansion in Beverly Hills. She had been left there to help sell the home, as part of the décor because the color of her feathers complemented the home’s interior paint. The two-foot-long Moluccan cockatoo had been there for some time and although the homeowners had sent their chauffeur to feed her, he had mistaken the empty hulls in her bowl for full ones. Sammy was starving. Through Sammy, the reader begins to learn about the trade in exotic birds, the way they are captured and traumatized to become house pets, a role for which they are mightily ill-suited. Birds of this type need a flock and will call loudly if they are left bored, with little to do. They need to fly, which can rarely happen in urban households. These birds forage and tear up objects to nest. They also live very long periods, decades. Because of this, parrots are frequently kept in inappropriate conditions and passed from household to household. In this process, they can be traumatized and engage in self-harming behaviors. “Sammy was ‘just a bird,’ but birds are extraordinary.’” The extraordinary nature of birds—and humans—is the book’s central theme. 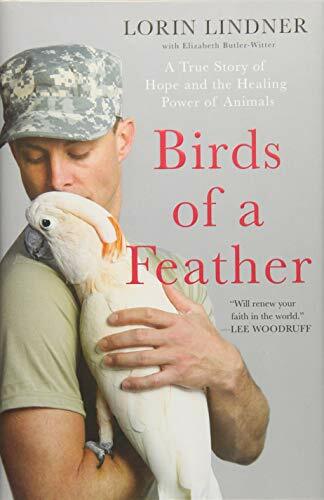 The stories of the traumatized birds and their rescue gives way in the book to the stories of veterans receiving treatment at the West Los Angeles VA center in Brentwood, California. Like the rescued birds, men and women too become traumatized by life events. Psychotherapists define this suffering as post-traumatic stress disorder (PTSD). Those who experience PTSD have a range of difficult-to-treat symptoms. They re-experience past traumas through flashbacks or intrusive thoughts. Many suffer from hyperarousal, a state in which the mind is constantly on alert. Symptoms of hyperarousal include: difficulty sleeping, anger, impatience, agitation, panic, and hypervigilance. It is difficult to carry on normal relationships with untreated PTSD. Yet many veterans who experience PTSD symptoms have had a difficult time accessing treatment. To help these veterans and birds in need, Lindner first assists with the creation of the New Directions addiction treatment program on the VA grounds. She considers this her calling, to help homeless veterans. She cites the way she was helped to earn her degree as the reason she was so eager and able to follow her calling. Learning to let people help is a critical part of this impressive story. The process of building and opening the New Directions treatment facility began in 1990. The project was hampered by bureaucracy and misunderstandings in the bureaucratic order about the scope of homelessness among veterans. Studies were undertaken to prove the need and an act of Congress was obtained so that construction of the center could begin. Through determination and persistence, New Directions was opened in 1997. It has space for 156 men to work on their sobriety for a year in a residential setting. In many ways, it is a highlight of the programming at the VA facility in West Los Angeles and has received awards for excellence. Lindner writes, “I wanted Serenity Park to be a meeting place for both humans and birds who suffer from the same stress-induced disorders. Understanding and empathy could be so much greater when both participants had the same obstacles to overcome.” This center is now a reality and available to veterans who come to the West LA VA campus. Lindner holds no punches. Birds of a Feather shares the ups and downs of the battles both the birds and people face. Birds die. Veterans are prescribed narcotics by overzealous doctors, even while these individuals are in a residential addiction treatment program. There are still too-long waits for needed care. But in the end, hope triumphs, as it always will when love is put at the center of the healing work we do. Birds of a Feather is a powerful glimpse into the struggles of people and animals who are working to overcome trauma. If you want an inspiring read that will give you a glimpse of wonder and light, this is the book for you.